The Borgesian world of alternative versions and director’s cuts – 50 of the most intriguing case studies, from Apocalypse Now to The Wicker Man. 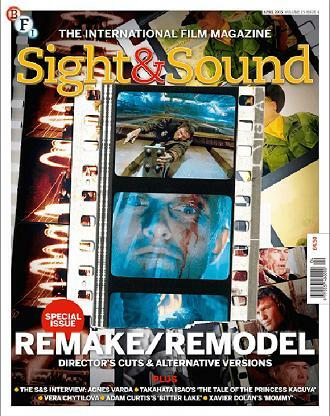 Plus Agnès Varda – a career interview and Gilberto Perez appreciation – and the return of Studio Ghibli’s Takahata Isao, the prolific Xavier Dolan, the pugnacious Věra Chytilová, Adam Curtis, Thom Andersen, Shirley Clark, Esfir Shub, John Carpenter’s soundtracks, Noah Baumbach’s While We’re Young and Fifty Shades of Grey. All films exist in slightly different cuts – because they have been dubbed, say, or censored for television – but sometimes the alternative versions are fascinating in their own right, with entirely new scenes and different rhythms that enable them to stand on their own against the original. Here we pick 50 of the most intriguing examples, from Apocalypse Now to The Wicker Man and Metropolis to Miami Vice. Introduced by James Bell. The introduction of talkies in the late 1920s posed a new set of problems for films hoping to play on the international stage. By Henry K. Miller. The broadcast requirements of television have resulted in badly bowdlerised cuts of some films, but also some superior longer versions. By Brad Stevens. Agnes Varda The veteran French director, who has recently been honoured with a Lifetime Achievement Award from the European Film Academy, began her career as a stills photographer before becoming one of the driving spirits of the nouvelle vague, marrying a deep humanism with a playful self-awareness to create a series of poetic, political works that have repeatedly championed the lives of the marginalised and dispossessed. Interview by Chris Darke. Studio Ghibli co-founder Takahata Isao has a reputation as an implacable perfectionist – and with its rare blend of raw line-drawings and watercolours, The Tale of the Princess Kaguya, his first movie in 14 years, took eight years and a kindly patron to make. By Nick Bradshaw. It wasn’t just the communist authorities in the aftermath of the Prague Spring who found the pugnacious, mercurial films of the late Czech director Vera Chytilová challenging – her uncompromising work was intent on pushing the very boundaries of cinema itself. By Michael Brooke. The extraordinary footage assembled in Bitter Lake, Adam Curtis’s powerful film about the tangled history of Afghanistan, offers some welcome insights – but in his bid to counteract the lazy fables of good and evil beloved of some politicians, is the director in danger of oversimplification too? By Jason Burke. Xavier Dolan’s first film, I Killed My Mother, was an autobiographical cri de coeur against the woman who had borne him. Five years on, the prolific director’s fifth feature Mommy finally offers the mother figure the chance to gain her revenge. By Ben Walters.